(Left to right) Representatives from Columbia Gas of Ohio, Luka Papalko and Corey Newsome spoke with customers who would be impacted by the replacement line project. Columbia Gas of Ohio held a customer information meeting on the Natural Gas Line Replacement Thursday evening at the Portsmouth Public Library. Luka Papalko, external affairs specialist for Columbia Gas, headed the meeting and outlined what the project would consist of, and how it would impact residents of the affected areas. According to Papalko, the project, which still has no exact start date, will begin with the marking of right of way and existing utilities with flags, stakes and temporary paint prior to the installation of the main line. Once completed the service line will then be replaced, the pipe which runs from the main line to the meter that services each home or residence, and at this point the customer will lose service for approximately 2-4 hours. Any indoor gas meters will be relocated to the outside of the home or business, and any interrupted surface, such as sidewalks, lawns and driveways will be restored. Columbia Gas has issued an information flyer noting that it may be several days or even weeks between some of the steps in the project. “What this really boils down to is us trying to proactively go out and upgrade our aging infrastructure, so a lot of the pipes have been in the ground 60-70 years and really it’s our job to go in there and upgrade with new state of the art features, make sure it’s all operating correctly, and since we started doing this leaks in all the pipe we’ve replaced have fallen about 40%,” Papalko said. Questions asked by residents included how parking would be effected, what would be done with the existing pipeline, and how would the project applies to those who rent. Papalko, with assistance from the Project Engineer, Local Field Operations Leader, Construction Leader, and Project Inspector, stated that while street parking would be interrupted to allow for heavy equipment, they will work with residents to create as little inconvenience as possible, and stated that after the new pipes were installed, the old pipes would be disconnected and would remain in the ground. Papalko informed the public that property owners as well as current residents who would be impacted by the project were also sent letters outlining project details. Representatives of Columbia Gas Stated that the project was set to begin “soon,” but an exact date has not yet been released. 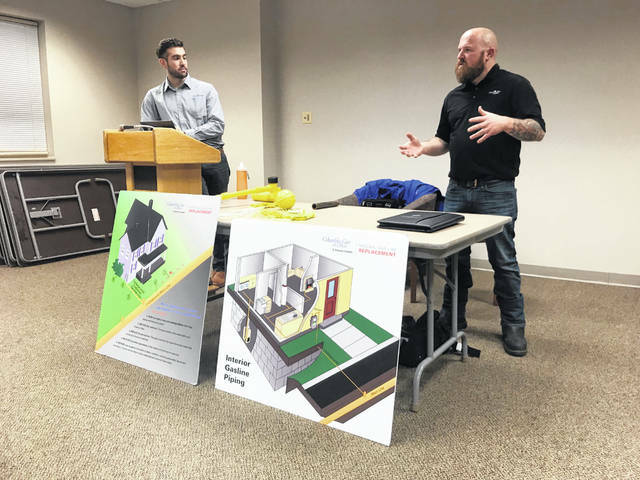 https://www.portsmouth-dailytimes.com/wp-content/uploads/sites/28/2019/02/web1_COLUMBIA11.jpg(Left to right) Representatives from Columbia Gas of Ohio, Luka Papalko and Corey Newsome spoke with customers who would be impacted by the replacement line project.